The Santa Monica College Emeritus Art Gallery is pleased to present "Faces of Invisible Women," a solo exhibition of works created by contemporary figurative artist Chris Hero. The exhibition is free and open to the public through Sept. 19. Hero's current body of work looks at women who are 'invisible' in society because they are over 70 years of age (most are over 80). "Faces of Invisible Women" – a collection of works by contemporary artist Chris Hero – will be on exhibit at SMC's Emeritus Art Gallery through Sept. 19. Shown here: Chris Hero: "Invisible Virginia," 2017, oil on paper. "All are active, hale, interesting people," he said. "They have been places. Done things. They have stories to tell. The history of our society is in these women, in their faces. Why don't we see these faces?" 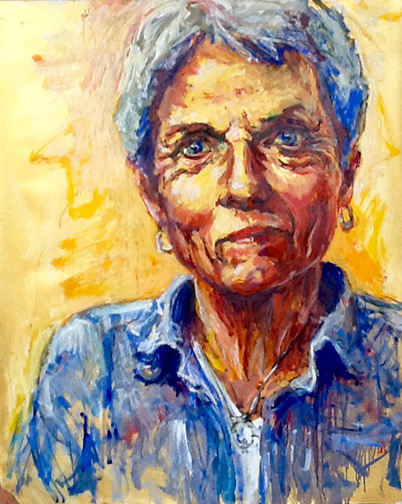 For the series of paintings on exhibit, Hero's artistic goal is "not a painted, photographic likeness, but to get a more expressionist 'feel' of each sitter." His portraits reveal more about who each woman is than what she looks like. "I am choosing to look at older women's faces." he said. "As they are. Not as a cautionary tale about vanity. Or as a joke, 'see the old lady saying outrageous things.' Not as a metaphor, and not as a yardstick with which to compare youth." Hero, who works from a studio in Venice, is a member of the SMC Emeritus faculty and a former art instructor at Loyola Marymount University (LMU). He earned a bachelor's degree in history from Loyola University, New Orleans, and an M.F.A. from California State University, Long Beach. His solo exhibitions — which have included paintings of impromptu roadside shrines, scenes of police brutality, and urban landscapes — have been presented in a variety of venues. "My goal in all the art making I've ever done has been to effect some degree of social change," said Hero. "Since I'm not good at political organizing, I've always looked to art work, and painting in particular, as my angle into an issue." SMC Emeritus Gallery hours are 8:30 a.m. to 4:30 p.m. Monday through Friday. For information, call 310-434-4306. The SMC Emeritus Art Gallery is located on the first floor of the SMC Emeritus Campus, 1227 Second St., in downtown. Parking is available next door in Santa Monica Public Parking Structure No. 2. SMC's widely praised Emeritus program – founded by Santa Monica College in 1975 as a noncredit program to serve the lifelong learning interests of older adults – offers more than 120 noncredit adult education classes and special programs that serve more than 3,000 students each year.